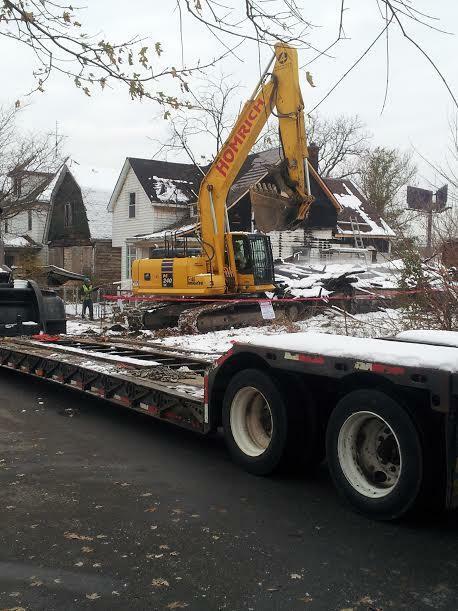 A demolition site in southwest Detroit. But the program has had a number of problems, ranging from improper handling of asbestos-laden materials to contractors burying debris onsite post-demolition. It’s also the subject of a federal investigation. Most recently, reports have surfaced that some contractors possibly used contaminated soil as infill on post-demolition sites. In January, a federal agency issued subpoenas demanding documentation from contractors about the sources of infill dirt. In a statement, MSHDA spokeswoman Katie Bach says the agency, which oversees blight elimination programs statewide, welcomes the inquiry and plans a “detailed response” to the congresswomen’s concerns. “We have consistently sought accountability as part of our program oversight, whether for procurement, invoicing, environmental safety or any other facet of the program,” Bach said. “In fact, in 2016, we asked U.S. Treasury to temporarily suspend Detroit’s program after which processes and procedures were put in place to address audit concerns. Bach said those added protections "include but are not limited to" more site inspections, contractor training, and dirt testing requirements. Farkas said the department has worked closely with federal and city officials on an investigation into the matter, and pledged to address Tlaib and Lawrence’s concerns. “We will be reaching out to their offices in the near future to set up a tour of the demolition program to help them better understand our thorough environmental safety measures,” he said.